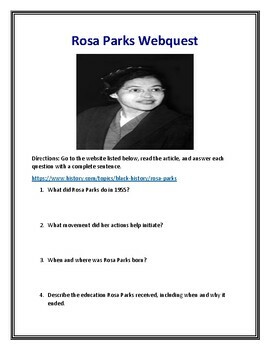 Rosa Parks (Black History Month) Webquest With Answer Key! 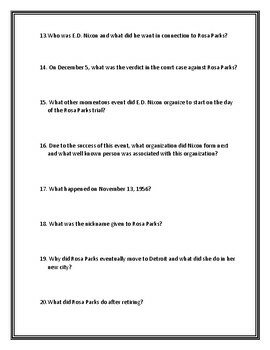 This 24 question History.com webquest will help students learn all about the inspirational Rosa Parks! Important dates and historical figures associated with the life of Rosa Parks. 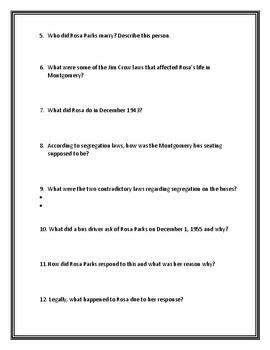 Details about the Jim Crow laws that had an impact on Rosa Parks and other African Americans during this time. Background on the childhood and education of Rosa Parks. Specifics about her refusal to give up her seat on a Montgomery bus. The impact this refusal had on the start of the Civil Rights Movement and the Montgomery Bus Boycott. The Supreme Court Case that was associated with these events. What Rosa Parks did after the court case and boycott and the honors given to her later in life. Students will love to learn all about this important historical figure in an independent webquest! An answer key is included for your convenience!